Post-operative pain management is a key responsibility of the junior doctor and is one of the most common “bleeps” to receive. Indeed with the careful applications of a few basic principles, it can often prove a simple and rewarding management. Pain can be divided into acute and chronic types. This article will predominantly focus on the assessment and management of acute pain. Subjective – Ask the patient to grade their pain on a scale of mild, moderate or severe. This can be assessed regularly as part of the nursing observations. An unwillingness to mobilise or agitation may be present in those that are less able to communicate their pain. Each patient should be assessed when mobile, when taking a deep breath, and when in bed (a pain-free patient in bed may well be in severe pain when they walk to the toilet!). It is important to assess for any underlying (and potentially treatable) causes for the pain. The World Health Organisation Analgesic Ladder (Fig. 1) is the best-known method for approaching pain relief. It provides a strategy for titrating analgesia, starting with simple analgesics and working upwards to strong opioids. After implementing a regime, the patient should always be reviewed within a couple of hours to assess adequacy. Initially starting with simple analgesics (such as paracetamol or NSAIDs), if the pain is not well controlled, move up to the next stage of the ladder and consider prescribing weak opiates, such as codeine or tramadol. Again, assess the response after a couple of hours; if this is still inadequate move to the next step and prescribe morphine or other stronger opiates. Consider alternatives to the oral route, such as topical, intravenous, or subcutaneous. If this fails and sinister causes of pain have been ruled out, consider specialist help and/or a patient-controlled analgesia pump. Any neuropathic pain may respond better to alternative analgesics (see appendix), such as amitriptyline or gabapentin. As patients recover, it is important to move down the ladder, and wean down the analgesia to a simple regime. It is always preferable to not send patients home with strong opiates. 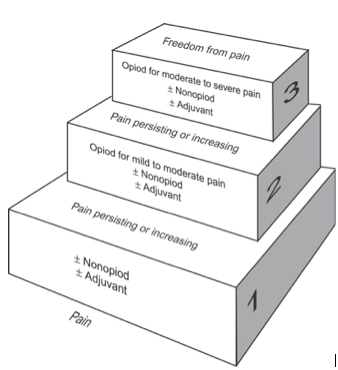 Figure 1 – The WHO pain relief ladder, commonly used in the management of pain due to cancer. Non-opioid analgesia consists of paracetamol and/or NSAIDs (e.g ibuprofen or diclofenac). NSAIDs work by inhibiting the synthesis of prostaglandins, thereby reducing the potential inflammatory response causing the pain. These anti-inflammatory properties mean such analgesics are often used in musculoskeletal conditions. They are also frequently used intraoperatively. Opiates are divided into weak opiates, such as codeine, or strong opiates, such as morphine, oxycodone, or fentanyl. They work by activating opioid receptors (MOP, DOP, and KOP), which are distributed throughout the central nervous system. These medications have a significant side effect profile; most patients will experience a degree of constipation and nausea. Thus, laxatives and anti-emetics are often prescribed concurrently. Other side effects include sedation and confusion, respiratory depression, pruritus, and tolerance and dependence (both of the latter are relatively rare). If PRN (‘as needed’) opiates are frequently called for, assess the 24-hour opiate requirement and consider titration into a regular basal dose of modified-release preparations. Post-operatively, many patients require more intense or immediate analgesia and their requirements exceed the capacity of nursing staff to provide. In such situations, patient controlled analgesia (PCA) can be used. PCA involves the use of IV pumps that provide a bolus dose of an analgesic when the patient presses a button. These are usually started in theatre (based on clinical experience of analgesia requirements of the specific operation by the surgical staff) or on the wards (often when strong opiates are inadequate). Provides analgesia that is tailored to the patient’s requirements. Safe – the risk of overdose is negligible. Can accurately record how much opioid is being administered, which can be converted to a regular dose. Can be cumbersome and prevent the patient mobilising. Not appropriate for those with poor manual dexterity or learning difficulties. Neuropathic pain results from irritation or injury directly to the nerves, either peripherally or centrally. It often presents with shooting or stabbing pains, and can be described as like an electrical shock. Following surgery, the prevalence of neuropathic pain is as high as 10%. It is frequently encountered in orthopaedic or vascular surgery, particularly in amputees (due to the nerve damage sustained when the limb is severed). Non-pharmacological treatment – cognitive behaviour therapy, transcutaneous electric nerve stimulation (TENS), or capsaicin cream (typically for localised pain). Pharmacological therapies – gabapentin, amitriptyline, or pregabalin. If these are not successful or not tolerated, specialist referral should be considered. According to the WHO analgesic ladder, for a patient who remains in pain (visceral) despite having regular paracetamol and ibuprofen, what additional analgesia should be trialled next? Which of the following patient groups should NSAIDs be avoided in? Which of the following is NOT a common side effect of opioid analgesia?